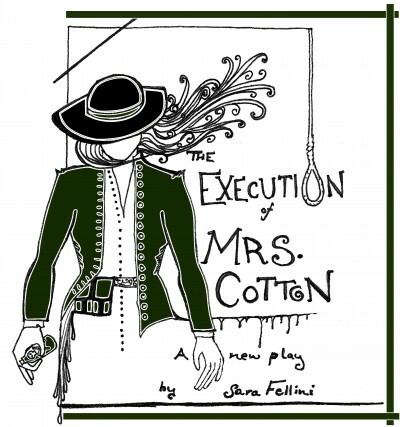 THE EXECUTION OF MRS COTTON by Sara Fellini tells the story of the life and times of Elva Zona Heaster Cotton, a serial killer in a gothic postbellum South. She preys, as all serial killers do, on victims who are most vulnerable to her: her husband and children. By taking a sympathetic look at the art of killing, this play deals with the value of women’s work, their art, and their voices, and explores how several working-class men could become vulnerable to a female serial killer, an artist in her own right, while the world around them rapidly industrializes. The cast features: Samuel Adams (Mildred Pierce, Boardwalk Empire), Adam Belvo (Planet Connections award-winning actor), Zina Ellis, Sara Fellini (Planet Connections Best Actress nominee), Jennifer Fouché (Sistas The Musical, The Mysteries of Laura), Cairo George, John Hardin (NYIT Best Actor nominee), Linnea Larsdotter (winner Best Actress – NYLA international independent film festival), Wes Mason, Kelly McCready, Costa Nicholas, and Sarah Ellen Stephens. The musical arrangements include compositions by C.W.K., live performance by Wes Mason and violin extemporization by Sarah Ellen Stephens. spit&vigor, in association with Theater 4the People, is the recipient of the 2015 Outstanding Premiere Production of a Play Award from the New York Innovative Theatre Awards, which includes an Artist Support Grant from the Donn Russell Fund. Founded in 2015, spit&vigor is a non-profit theater company devoted to the development of new work and spirited, innovative productions of existing work. Our small roster of work has been critically acclaimed and award winning. In collaboration with theater company Theatre4thePeople, our production of In Vestments in May 2015 was nominated for and won the NYIT award for Outstanding Premier Production of a Play, for which we were also awarded the prestigious Donn Russell grant. In December 2015, we produced John Patrick Shanley’s DANNY AND THE DEEP BLUE SEA, which ran for 3 weekends at Under St. Marks. We believe in theater as a vital art form and it is a priority for us to compensate artists with whatever meager means we have available. Our work exemplifies total theatre, a life that informs art and art that deeply informs our lives. We strive to infuse our work with all of our joy, all our sorrow, every last ounce of empathy and all of our strength, every weakness and flaw, every terror and with all our exuberance; our mission is to perform work that involves blood, sweat, tears, spit & vigor. Written and produced by company members that wrote and produced IN VESTMENTS, winner of two 2015 NYIT Awards: Outstanding Premier Production and Outstanding Direction, and acclaimed by the NYTimes as “wrenching and visually eloquent”.